Most soldiers distrusted civilian newspapers, which were usually hyper-patriotic and overly optimistic that the war would soon be over. Soldiers turned instead to one another for their news, and some units published their own newspapers. Trench newspapers were a venue for common soldiers to give public expression to their thoughts. 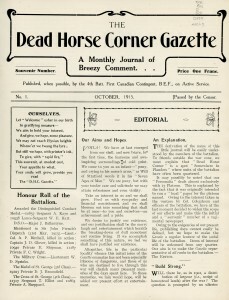 Popular Canadian soldier-produced papers including The Listening Post and The Dead Horse Corner Gazette satirized and ridiculed the hardships of war through articles, poetry, jokes, and cartoons. 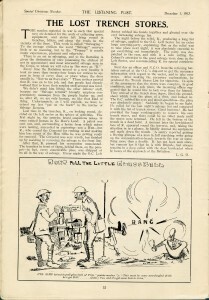 While military censors prohibited the publication of some information, trench newspapers could be surprisingly frank. They were a “safe” environment for soldiers to reveal their anger and antipathy to their hard life, although these messages were often couched in humourous jokes and puns. There were over 30 different Canadian trench newspapers during the war. Few copies remain.